Many injured workers mistakenly assume that the state is involved in a workers' compensation claim from the start. However, at the beginning of the process, the insurer simply reviews your case and makes a decision about whether to approve or deny your benefits. If you receive an insurer's notification of denial, you should consult an experienced Boston workers' compensation claim attorney at Pulgini & Norton. If your Massachusetts workers' compensation claim is denied, you will receive an insurer's notification of denial, or Form 104, by certified mail. The form should include an explanation of why your employer's insurer is denying your claim. The insurer's decision is not the last word as to whether you deserve workers' compensation benefits, and you should not assume that the state denied your claim. In some cases, the insurer has denied the claim based on a technical point or because your employer failed to give sufficient information for the claim to be paid. In other cases, your claim may be partially allowed and partially denied, meaning that the insurer is amenable to paying certain benefits but not others. It is important to immediately consult an attorney if you receive a copy of Form 104. There are time limits that apply to workers' compensation claims, and if you are disabled by a workplace injury or illness, you do not want to lose any rights you may have to compensation. You will have the right to file a claim with the Department of Industrial Accidents (DIA). The DIA is the governmental entity that administers workers' compensation benefits. Related to the Form 104 is the Form 106, which is a notice of termination, and Form 108, which is an insurer's request to modify your compensation. The Notice of Termination, like the Form 104, is from the insurer rather than the DIA, as is the Form 108. If you receive a Form 108, you have the right to file a claim, just as you do with a Form 104. A request to modify from the insurer indicates that the insurer wants to modify your benefits and is initiating a process to ask an administrative law judge at the DIA to stop or reduce your benefits. You have the right to appeal both partial and full denials of claims. The Form 104 will include instructions on how to appeal a denial and what the timeframe is. However, the claims process can be challenging for laypeople to understand, and once certain preliminary decisions are made, it can be difficult to change a judge's mind. Therefore, it is important to have experienced legal representation from the start, whether you receive a Form 104, 106, or 108. When you are appealing a Form 104, you must file an employee's claim, also known as a Form 110. 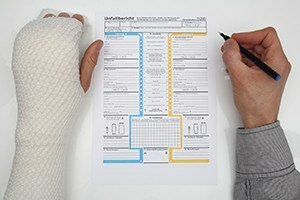 Alongside the form, you will need to submit all medical evidence. This includes both medical bills and medical records. All of your documentation as well as the Form 110 should be sent to the DIA and the insurer. The DIA will schedule conciliation, which is just the first stage of appeal. The other stages are the conference, the hearing, the Review Board, and the Massachusetts Court of Appeals. If you are injured or made sick on the job, you may be eligible for workers' compensation benefits. Unfortunately, many legitimate claims are initially denied. If you receive an insurer's notification of denial (Form 104), it is important to consult a workplace accident attorney. At Pulgini & Norton, our workers’ compensation lawyers advise Boston residents as well as individuals in Medford, Quincy, Brookline, and other cities throughout Massachusetts. Call us at 781-843-2200 or contact us via our online form for a free consultation.